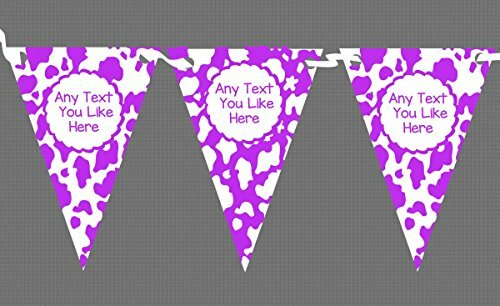 This Personalized Bunting is printed one side onto the highest quality silk finish 260 lb card, The holes are pre-punched ready for you to thread through the ribbon yourself. The ribbon is provided. You can choose up to 4 different personalisation messages as standard. Every flag will be Personalized,if you choose one message it will printed on all 12 flags,if you specify 4 different lots of text, we will personalise 4 flags with each message to make up your 12 flags. Available in 2 different sizes. Large- 12 flags, each measuring approx 7inches at the widest width and approx 9.5inches long with 120inches of ribbon. Small - 12 flags, each measuring approx 5.5inches at the widest width and approx 7inches long with 100inches of ribbon. Available in 2 different sizes. Large- 12 flags, each measuring approx 7inches at the widest width and approx 9.5inches long with 120inches of ribbon. Small - 12 flags, each measuring approx 5.5inches at the widest width and approx 7inches long with 100inches of ribbon. This Personalized Bunting is printed one side onto the highest quality silk finish 260 lb card, The holes are pre-punched ready for you to thread through the ribbon yourself. The ribbon is provided. You can choose up to 4 different personalisation messages as standard. You can email us at info@redheartprint.com - please remember to include your name and order number in your email. Or you can tick the gift option during checkout to leave us a gift message or contact seller to send us an amazon message. Or Call us on (618) 708 6412 9am-5pm central time. For our personalized items, please check your spelling and send us your details exactly as you would like them to read. We will correct any spacing according to our templates. We may be able to change fonts & colours as required and you can choose any text you like. We have a huge range of personalized cards, invitations, wedding signs, prints, bunting & posters. Please see our store for more options. View More In Banners & Garlands. If you have any questions about this product by The Card Zoo, contact us by completing and submitting the form below. If you are looking for a specif part number, please include it with your message.